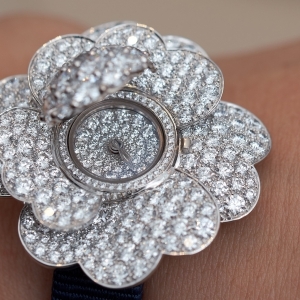 The gates of Van Cleef & Arpels’ booth at SIHH always open onto a magical world. Sometime it is an enchanted forest, at other times it is a pond with fairies – this year, the path led us to the secret garden of Van Cleef & Arpels. When the night fell, we looked up to the dancing planets. Come in, they are beautiful! The Maison always pays attention to the details when designing the booth. Colours, forms and scents evoke the topic of the year. Fresh flowers were all around and the walls with the motifs of rich meadows looked like stained glass lit from behind. 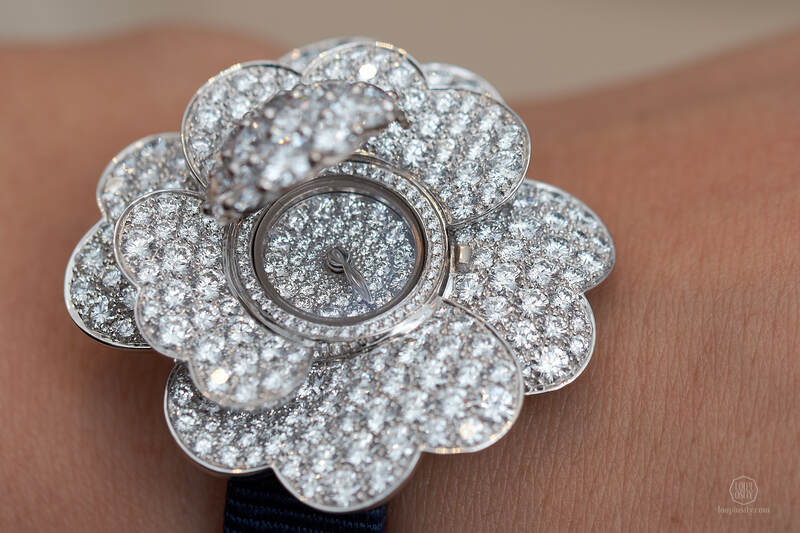 Flowers have paved the way to “Le Jardin Van Cleef & Arpels”, the creations of which inspired 5 unique high jewellery pieces (the Chrysanthème, the Dandelion, the Pivoine Secret watches and the Pâquerette and Myosotis) and 3 repetitive Secret watches (Marguerite, Primrose and Cosmos). 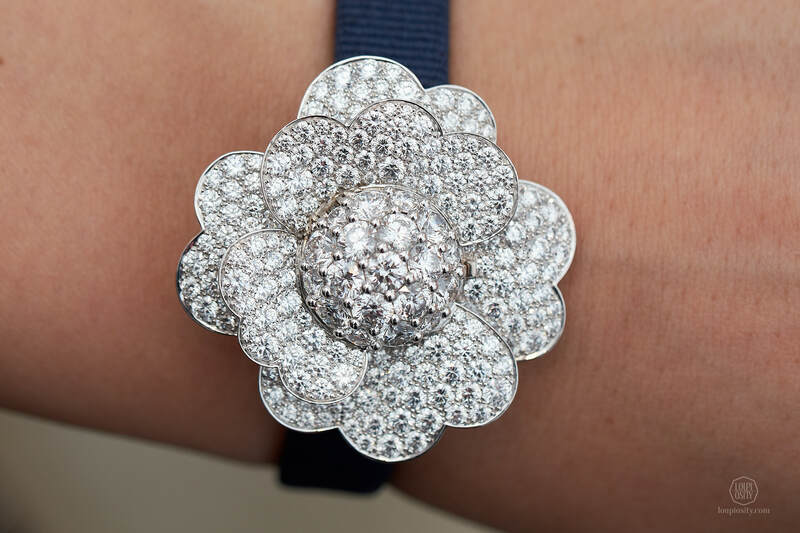 The House has loved the flower motif since the inception and various spices have appeared this way or another on the timepieces and jewellery. The Cosmos creations were born in the 1950’s. The cosmos flowers are native in meadowland Mexico and they arrived to Europe during the onset of the 19th century. All of their variations have big, colourful and bright petals. 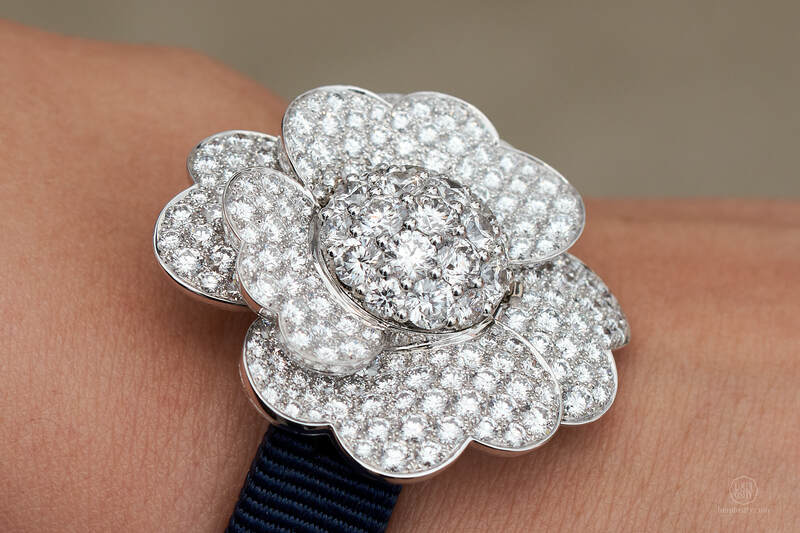 The brand dedicated a collection of rings, necklaces and earrings to cosmos flowers. The new Cosmos Secret watch reflects the plant’s vivid freshness. 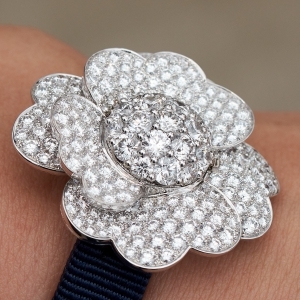 The flower head is three-dimensional and the petals are inclined and covered with diamonds. They are set with the “serti neige” style (or snow setting), where gemstones in various sizes are set side by side in a way that they completely cover the metal. 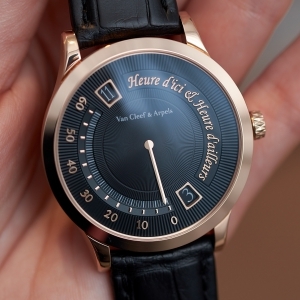 The 12mm diameter dial is hidden underneath the central disc. 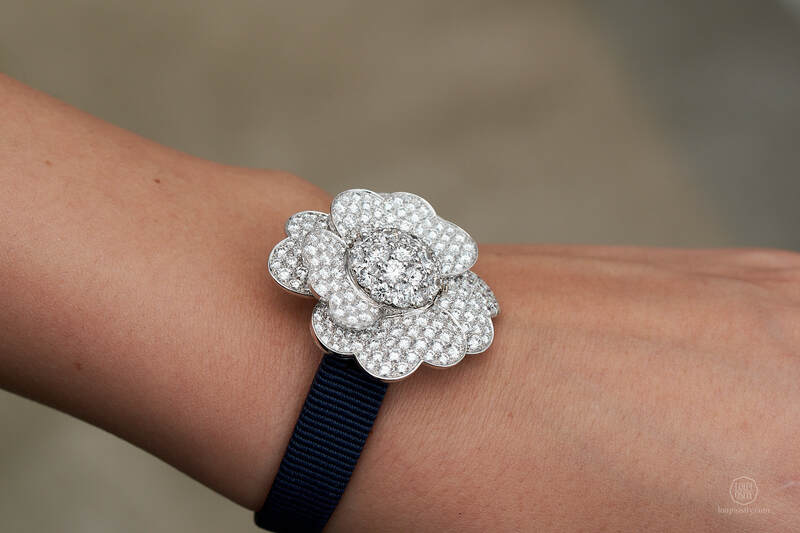 Like with many such creations of Van Cleef & Arpels, the watch can be worn with a navy blue grosgrain bracelet or as a clip. 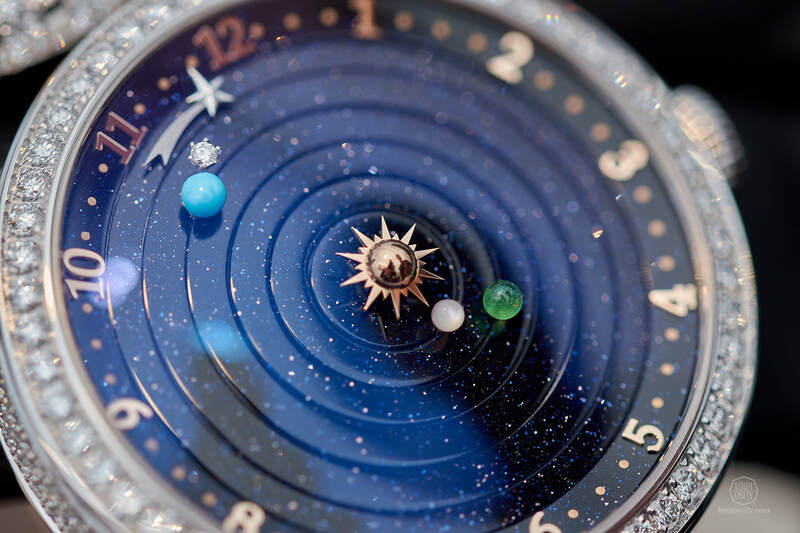 In 2014 Van Cleef & Arpels presented the Midnight Planétarium Poetic Complication, a very special complication watch. Six tiny planets orbit around the Sun, each following its actual solar travelling time. 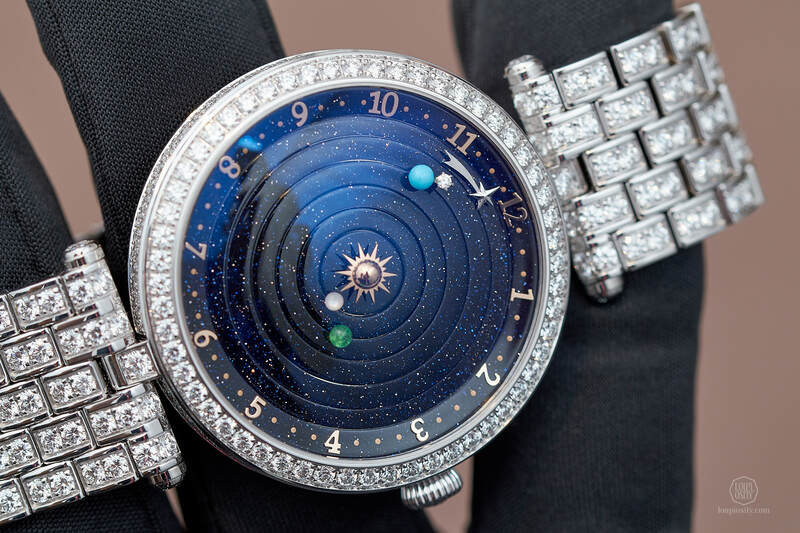 The movement was developed together with Christiaan van der Klaauw, a member of the Académie Horlogère des Créateurs Indépendants (AHCI), who creates astronomical clocks and wrist watches. 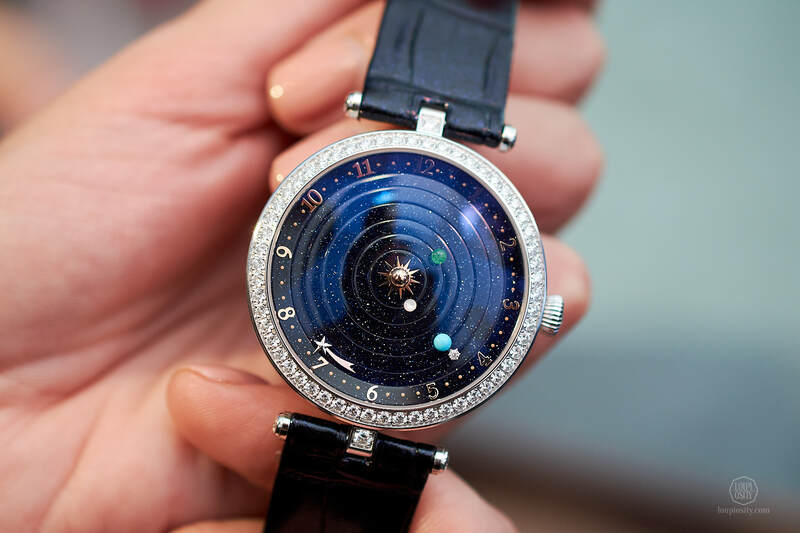 In 2018, VCA showcased “a feminine vision of the cosmos”, the Lady Arpels Planétarium, which they emphasise is a completely new development with a movement designed from scratch. 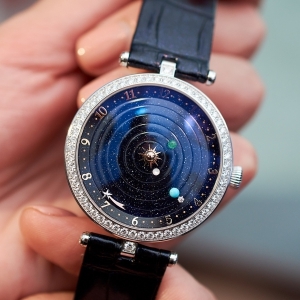 The new Lady Arpels Planétarium is 38mm, thus much smaller than the 44mm Midnight Planétarium Poetic Complication watch. It is beautiful with a fabulous deep blue aventurine dial and tiny gemstone and precious metal beads acting as the celestial bodies: Mercury in pink mother-of-pearl, Venus in green enamel, Earth in turquoise, Moon in diamond, the Sun in pink gold in the centre of the dial and the shooting star at the most external rotating ring in rhodium-plated gold. Mercury, Venus and Earth orbit around the Sun. The Moon, frequently associated with femininity in mythology (called Luna by the Romans, Selene and Artemis by the Greeks), orbits around the Earth. Each heavenly body moves at its actual speed: 1 revolution in 88 days for Mercury, 224 days for Venus and 365 days for Earth. 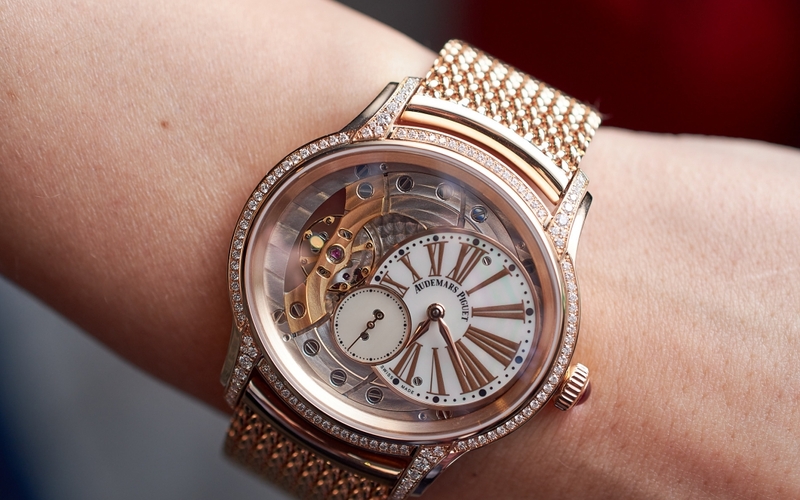 The dial is composed of seven rings. The orbits sit on their respective ring and each ring moves according to its calibrated time. The Moon takes 29.5 days to return to the same point and it is fixed to the arbour of the Earth, which rotates together with its companion. 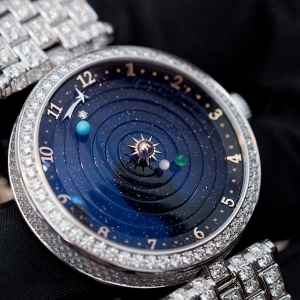 A rhodium plated gold shooting star indicates the time on a 12 scale at the circumference. 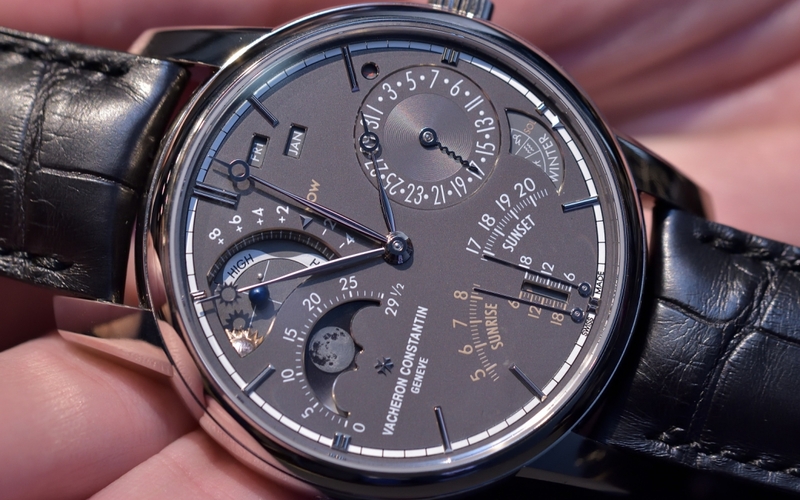 A timepiece like this requires generosity – the markers represent 15-minute intervals. The case back is crafted from gold and aventurine. 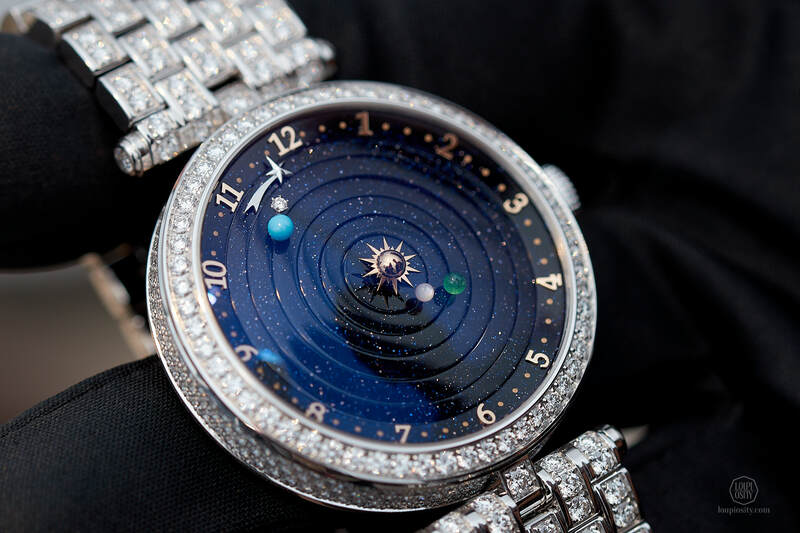 The oscillating weight of the automatic movement is in white gold and black PVD is decorated with the crescent of the Moon with “serti neige” style diamonds and the Earth in turquoise. Small ornamental stones echo the planets. The movement was designed for this smaller size from ground up by Stern Créations S.A (branch of Richemont) in collaboration with the above mentioned Christiaan van der Klaauw. 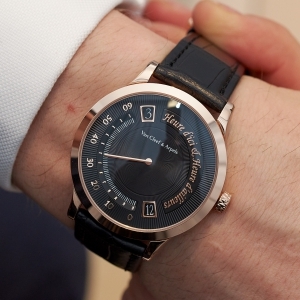 The Midnight Heure d’Ici & Heure d’Ailleurs is a new dual time zone watch in the masculine range of Van Cleef & Arpels. 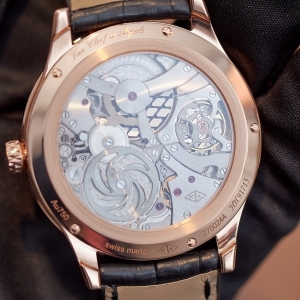 The self-winding mechanical movement was developed by Agenhor especially for Van Cleef & Arpels. 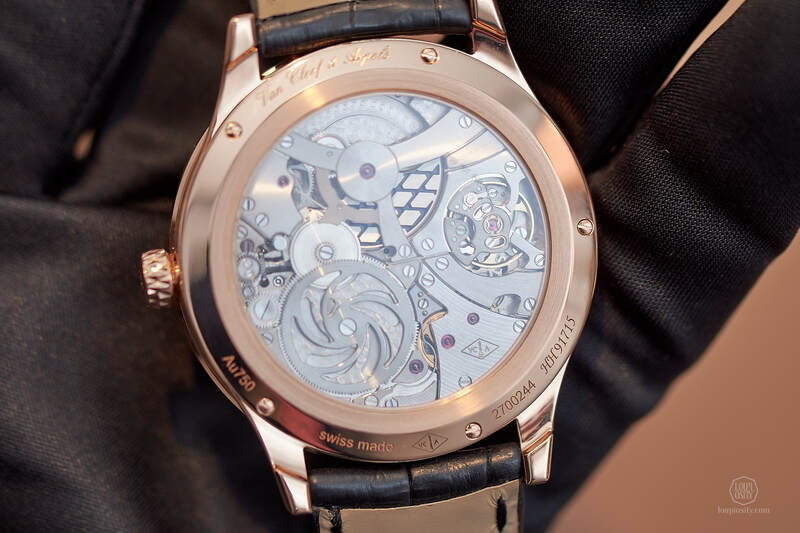 Agenhor is an abbreviation for the Atelier Genevois d’Horlogerie – an independent watchmaking company in Geneva, specialising in the design of complex mechanical modules. 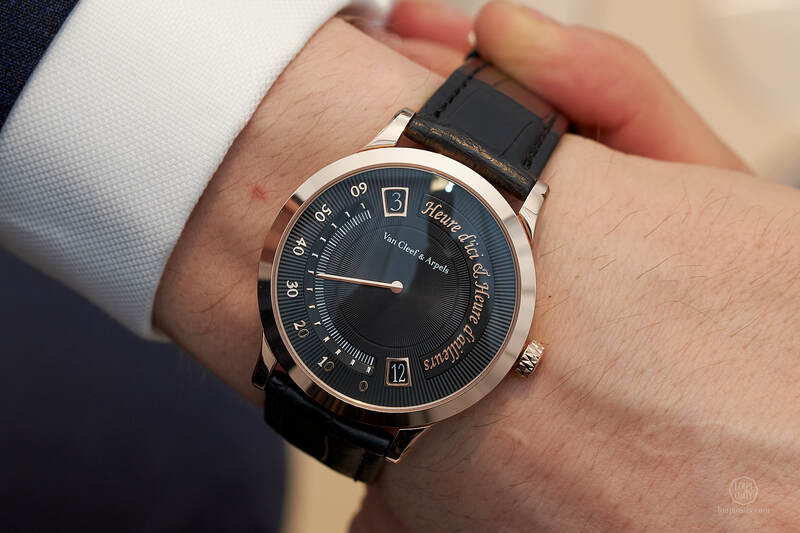 The AGH-6029 movement with double jumping hour and retrograde minute debuted in the 2014 Pierre Arpels Heure d’Ici & Heure d’Ailleurs Watch. 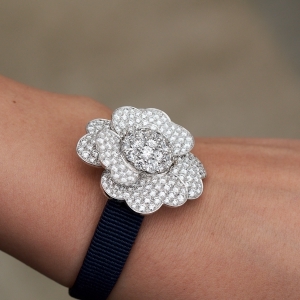 The new model is warmer and bolder than its predecessor but not less elegant. 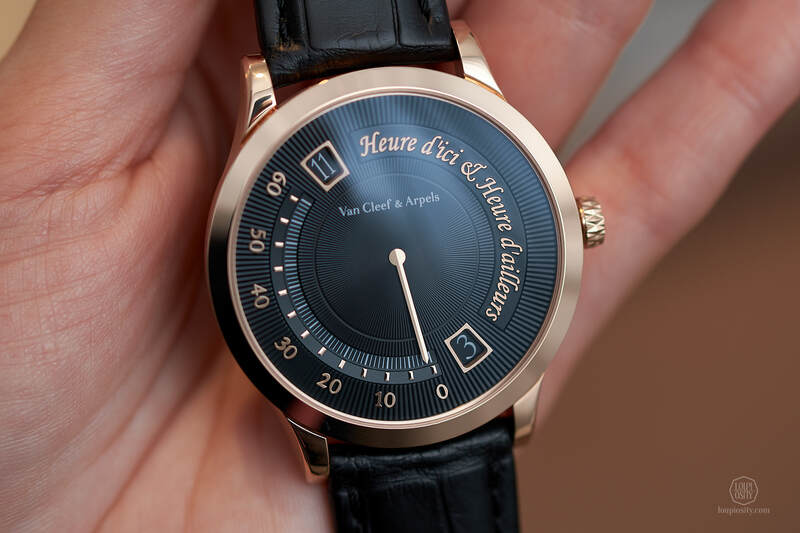 As its name suggests in French, Heure d’Ici (Hour Here) and Heure d’Ailleurs (Hour Elsewhere) are two time-zones displayed in two apertures. They jump simultaneously thanks to a single sector that synchronises both hour disks with the minutes’ retrograde hand. The minute hand runs on a 60-minute scale before jumping back to zero. 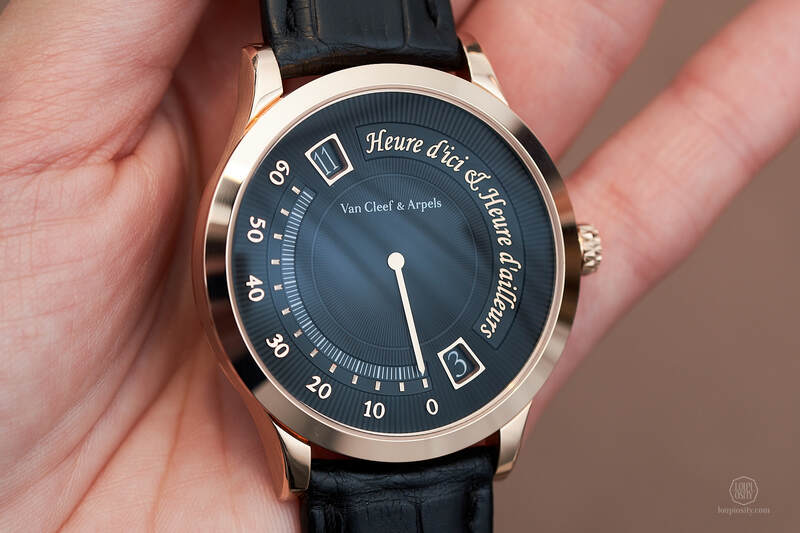 The 42mm pink gold case, the design of the black galvanic brass dial and the movement epitomises the masculine elegance “á la Van Cleef & Arpels”. 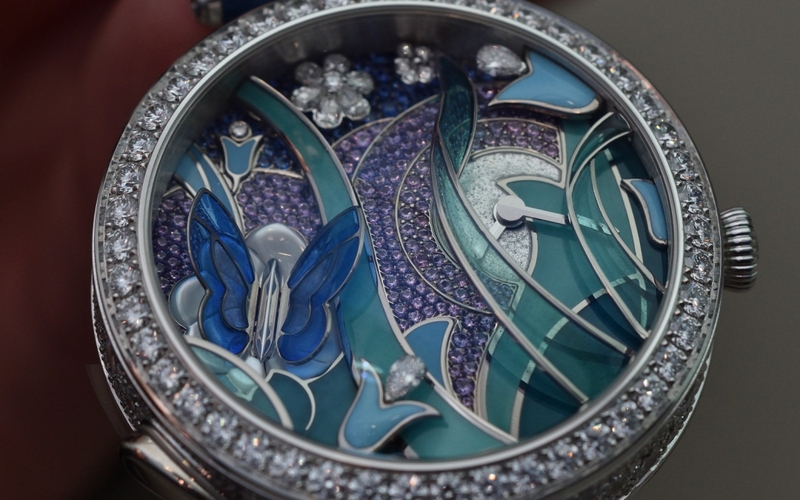 Wings on the wrist Two breathtaking automata stole the show at SIHH 2017, incorporating two beloved figures of Van Cleef & Arpels: the fairy and the butterfly. 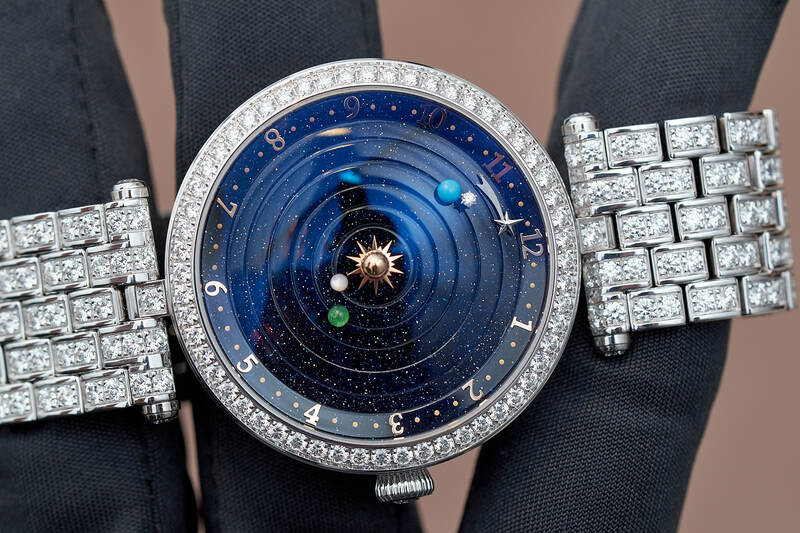 Girls don’t just wanna have fun – Part 14, SIHH edition In this series we showcase mechanical and artistic wonders that were especially designed for women and others originally for men that come alive on spirited ladies’ wrists. 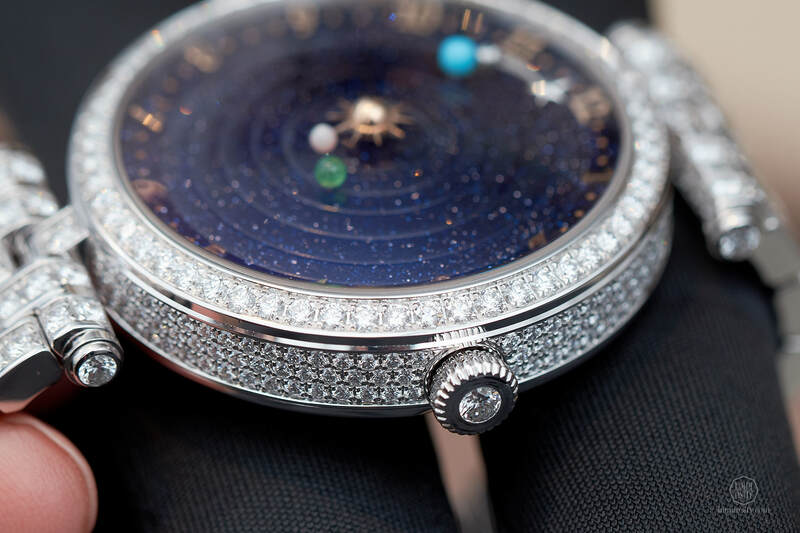 We browsed the SIHH 2018. 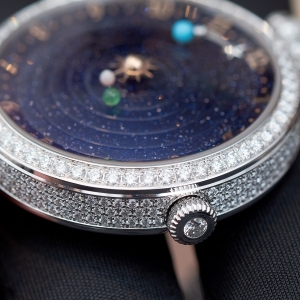 Vacheron Constantin – SIHH 2017 Following the exact footsteps of the “Reference 57260”, Vacheron Constantin presented the Les Cabinotiers Celestia Astronomical Grand Complication 3600, with 23 complications displayed on twin dials.